With a new name and new stake in the Pilbara, Hardey Resources Limited (ASX:HDY) now boasts a formidable portfolio of gold and copper projects across the country. The last time we caught up with this active small-cap, it was settling its acquisition of Hardey Resources and preparing to change its name from Elysium Resources. 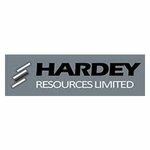 With the acquisition of Hardey Resources, the company gained the Bellary Project near Paraburdoo in WA’s Pilbara region, that’s prospective for conglomerate-hosted Witwatersrand-style gold mineralisation. 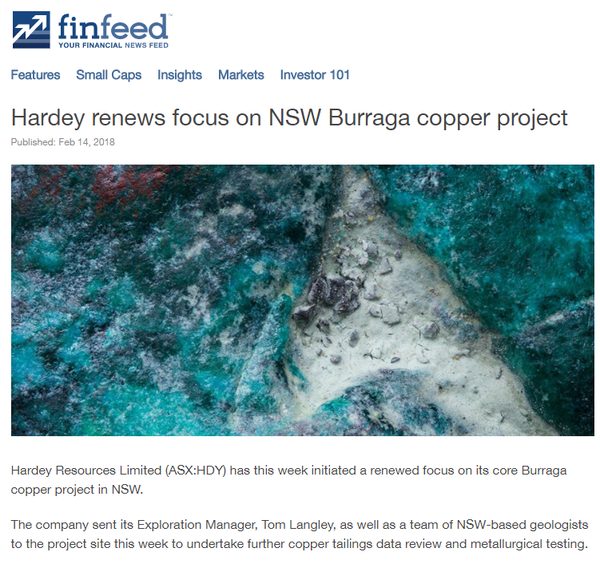 HDY also confirmed it has renewed its focus on its flagship Burraga Copper Project in NSW, which is centred on the former Lloyds Copper Mine, where it has just concluded preparatory work for the commencement of a significant drill program. Drilling will be conducted ahead of schedule, commencing in the next quarter, just a few weeks from now. Although results from this coming round of drilling are speculative at this stage, so investors should seek professional financial advice if considering this stock for their portfolio. The coming drill program will build on previous drilling results whilst looking to further extend known mineralisation at Lloyd’s. This program promises to be the most progressive copper drilling program at Lloyd’s in modern times. In March this year, HDY’s dreams for Burraga and beyond received a breath of fresh air through the completion of a A$1.37 million capital raising. The funds will be used towards progressing the Burraga Project including the imminent drilling, and will provide a bit of extra support for its WA gold plays as well. 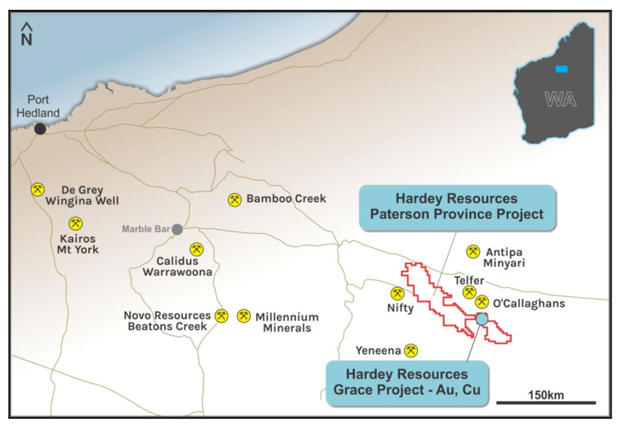 HDY continues to explore its Grace Gold Project in the Telfer region of WA’s Paterson Province and in February the company hit a milestone, announcing a Maiden Mineral Resource estimate at Grace — totalling 186,000 ounces of contained gold. The estimate is based on a Resource comprising 1.59 million tons at a grade of 1.35 g/t for 69,000 contained ounces of gold (Inferred), plus the further 64,000 and 117,000 contained ounces. HDY has pegged for additional exploration targets. Hardey Resources (ASX:HDY) has collated a number of high-potential copper and gold projects across the country, with the Burraga Copper-Gold Project in NSW, its Grace Gold Project in WA’s Paterson Province, and new Witwatersrand-style gold exploration licences — plus a name change and capital raise. Yet it is Burraga which holds current attention. The Burraga Copper-Gold Project, located in the world class minerals province of the East Lachlan Fold Belt in central-western NSW, consists of three contiguous exploration licences (EL6463, EL6874 and EL7975) and one exploration licence application (EL5454) covering a total area of approximately 221 square kilometres. HDY’s main focus of its copper exploration at the Burraga project is to confirm extensions to the original Lloyds Mine ore body. Between 1880 and 1920, then intermittently up to 1961, Lloyds Copper Mine produced 19,443 tons of copper from 469,626 tons of ore implying a recovered grade of 4.14% copper. HDY’s landholding at Burraga comprises about 84 square kilometres, including the village of Burraga — which is a short distance from the prolific Lloyd’s Copper Mine. 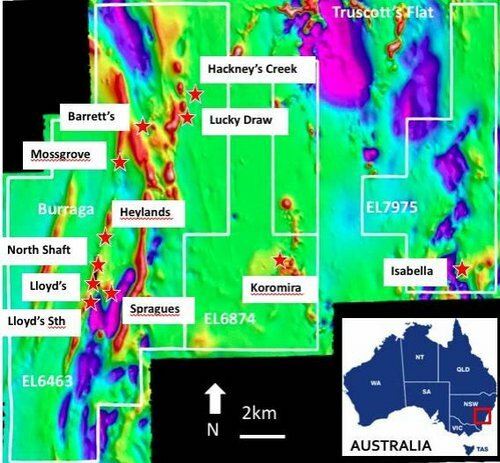 While Burraga has remained somewhat in the shadows throughout the company’s recent activities in WA, it still remains HDY’s #1 contender for serious exploration upside. In February, HDY released an update outlining its plan to renew its main focus on Burraga. 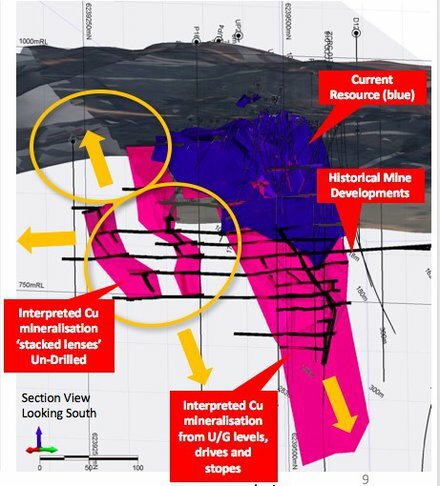 As part of the company’s shift to bring Burraga back into the spotlight, it sent its exploration manager armed with a team of geologists to the site to undertake more copper tailings data review as well as metallurgical testing. This was designed to kick off what HDY hopes will be a renewed focus on Burraga over the next two quarters. This renewed focus includes a drilling program, which will kick off just weeks from now – well ahead of schedule. Drilling will test the model of the ore body at the Lloyd’s site (see image below) with holes specifically designed to test the eastern extent of the ore body. The program will also test mineralisation at depth as predicted by the stacked lens model. As stated, this program promises to be the most progressive copper drilling program at Lloyd’s in modern times. Drilling will also provide additional data for the hyperspectral model of the Lloyds site. Further drill targets across the Burraga project will be targeted in the remainder of 2018. The hyperspectral model produced for the Lloyd’s copper mine will drive future target generation for drilling at Lloyd’s, whilst the team is also in the process of finalising holes at Hackneys and Isabella, where work continues to progress through the planning phase. In the image below you can see known polymetallic, copper and gold prospects projected on a regional magnetic anomaly map. In this image, you can also see the proximity of Hackney’s Creek, which has a JORC 2004 Inferred Resource of 2.2Mt at 1.44g/t gold for 101,800oz gold, to the Lucky Draw Gold Mine. Hackney’s Creek shares geological similarities with Lucky Draw which processed 1.41Mt at 4.2g/t gold for 191,000 ounces of gold between 1989 and 1992. Planned drilling is expected late this year to test deeper targets once access negotiations are finalised. Meanwhile, historical data at Isabella is being finalised, with two RC drilling holes also planned for later in the year. HDY has indicated a sizeable budget of ~A$500,000-$1,000,000 over six months for Burraga, depending on the exploration results it gets throughout. Of course commodity prices do fluctuate and investors should take all publicly available information into account and not base any decision on commodity prices alone when considering this stock for their portfolio. Grace: a golden ticket to the Telfer region? 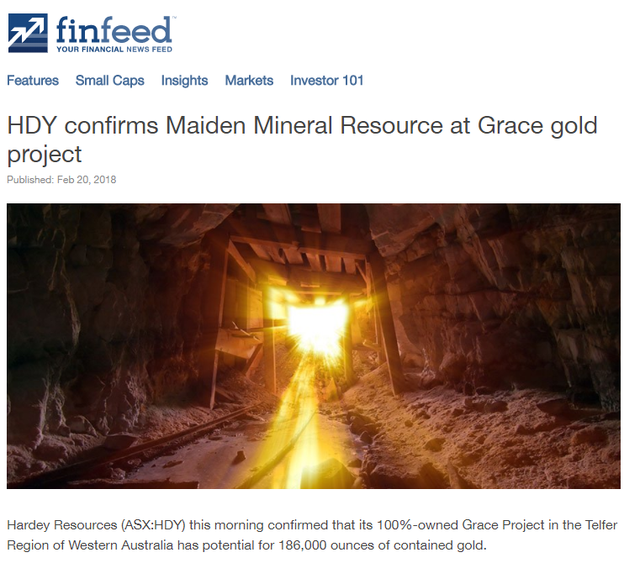 Some of the biggest news to come out of HDY in the last few months was the announcement of a Maiden Mineral Resource at the Grace Gold Project in WA. The Indicated JORC-compliant Estimate shows potential for 186,000 ounces of contained gold. Broken down, the estimate is 1.59 million tons at a grade of 1.35 g/t for 69,000 contained ounces of gold (Inferred), plus an additional exploration target for a further 64,000 and 117,000 contained ounces of gold. 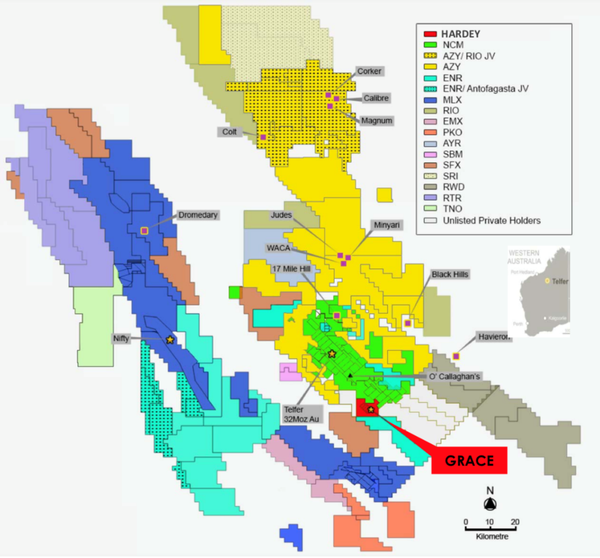 The estimate relates to a portion of the mineralised zone at the Grace Project (1140m strike length of a total strike length of 4130m), with the findings supported by adequately-spaced drilling with both RC and diamond core drilling used. Of particular value for HDY’s future prospects at the project is the fact that the Resource is open along strike and at depth — so we could be set for a significant upgrade at the project down the track. More exploration is required for HDY to prove up the concept at the new exploration target... as well as to look into the copper mineralisation it observed at the same time. 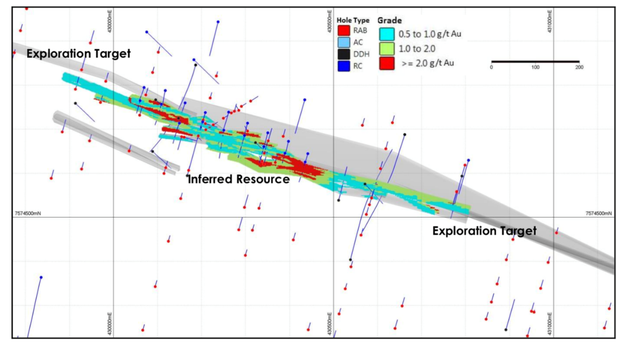 HDY’s copper hopes at Grace are in the preliminary stages as there’s not yet enough adequately spaced data to model it out. Nevertheless, it’s another observation that will help the company build its case for the significant value yet to be liberated at the Grace Project. The Maiden Resource estimate marks the first major step along HDY’s path towards building an economically viable Resource to exploit at Grace — with the Estimate modelling now ready to be used as a blueprint for efficient drill program planning. And looking at the potential for further gold and copper discoveries, rock chip sampling returned results as high as 52.3 g/t gold and 29.49% copper. The exploratory evidence gathered so far points to high-grade shallow oxide gold mineralisation commencing from surface. That means it becomes economically viable to extract the gold. 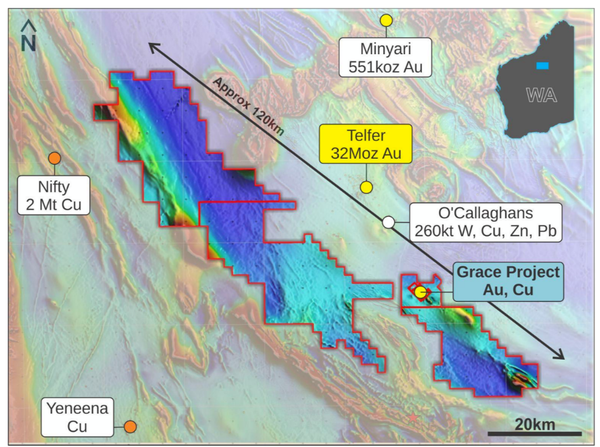 High-grade primary gold remains open in all directions at the Grace deposit, with substantial potential for regional greenfields exploratory success. In fact, HDY has taken to the concept of regional expansion pretty quickly, with an announcement in January that the company made good on an opportunity via increasing its land position in the Telfer District (where the Grace project is located). This also happens to be the same region within which Rio Tinto recently applied for an additional 5913 square kilometres, and for which the $15 billion capped Newcrest Mining (ASX:NCM) has demonstrated recent renewed interest. Other players like Encounter Resources (ASX:ENR), Antipa Minerals (ASX:AZY), and the recently listed Carawine Resources (ASX:CWX) are also active in the region, with holdings not far from HDYs. With such promising news filtering through from this project, HDY is also undertaking a drill tender process for more upcoming programs while simultaneously planning heritage surveys, discussions of which should be completed within the next few weeks which will enable site access and permit drilling in the September quarter. As such, shareholders should prepare to hear more about the Grace side of the portfolio in the coming months. A first pass reconnaissance field exploration program has now been completed. Six gold nuggets were discovered within the Hardey Formation basalt conglomerate via metal detecting over a 50m strike extent. Rock chip samples from outcropping quartz veins recorded a best result of 3.89% copper and 0.9g/t gold. This followed the discovery last year of conglomerate-hosted Witwatersrand style mineralisation in the Pilbara by Novo Resources (TSX-V:NVO) and JV partner, Artemis Resources (ASX:ARV). With plenty of players, big and small, subsequently flocking to the golden hot spot, HDY set themselves up to be part of a game-changing rush on the Pilbara. Although, this remains an early stage play for HDY and investors should seek professional financial advice if considering this stock for their portfolio. HDY’s total landholding in the region now totals 512 square kilometres, where it is undertaking mapping, stream sediment, rock chip sampling and metal detecting programs to progress the project. As things ramp up across HDY’s portfolio, the company hasn’t forgotten that money makes the drill-bits go round... as evidenced by its announcement in March. In March HDY announced a share placement at 0.4 cents per share to raise ~ $1.37 million (before costs) through a placement to sophisticated and professional investors. The placement is now complete and the cash was raised to boost its exploration efforts, with particular focus on NSW, in line with the Burraga Copper Project’s return to front-of-mind. Beyond that, some of cash is earmarked for HDY’s new Pilbara play, as well as the Grace Project. With several high-profile, high-potential metals projects on the go across the country, plus a name change and capital raise, it would seem that HDY is getting all the luck — or, as we’re more inclined to believe, it simply has a top team full of seasoned experts who know what they’re doing. There are macro factors that certainly aren’t hurting HDY’s chances of success, either. 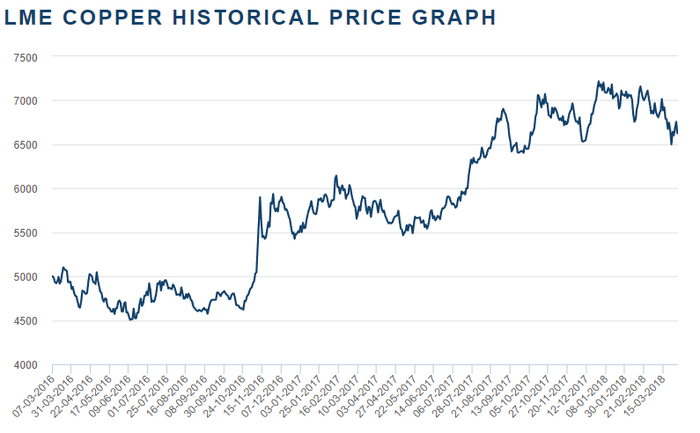 Its copper play has come along at a good time, with an increase in demand for copper over the last 12 months (thanks to the heavy use of copper in electric car batteries) and a supply deficit looming on the horizon... predicted to only worsen over the next couple of years. HDY is wasting no time pursuing its newly found Pilbara projects, meanwhile making considerable headway at its Burraga copper project, where drilling will kick off shortly.